On Saturday morning, an Israeli jet was shot down over Syria by regime air defenses, marking the first time an Israeli jet has been shot down during the Syrian war. According to an Israeli military spokesman, the jet was sent deep into Syria in order to strike an Iranian drone control facility near Palmyra. Earlier, an Iranian drone was reportedly intercepted over Israeli airspace. The shooting down of the Iranian drone and Israeli jet is a major escalation in the proxy war between Iran and Israel taking place in Syria. And while major news outlets latch onto the military footage of an Israeli helicopter blowing up a drone, or of the fire engulfing wreckage of the Israeli jet, other forms of escalation have received far less attention but are more telling of the extent to which the Israeli/Iran conflict has steadily grown and become protracted. While Israel has periodically sent jets to strike Iranian targets around Syria, it has also carried out an occupation of southwestern Syria that is now quietly expanding many miles beyond the Israeli-controlled area of the Golan Heights. At its core, the Israeli policy of intervention in Syria has been to stem any military threat from Assad’s regime or Iran. Iran, for its part, supports Assad with a host of logistical assistance and supplies, in addition to using Hezbollah, an Iran-backed militia, as an effective ground force. Both Israel and Iran see the war in Syria as a platform from which geopolitical power can be gained. 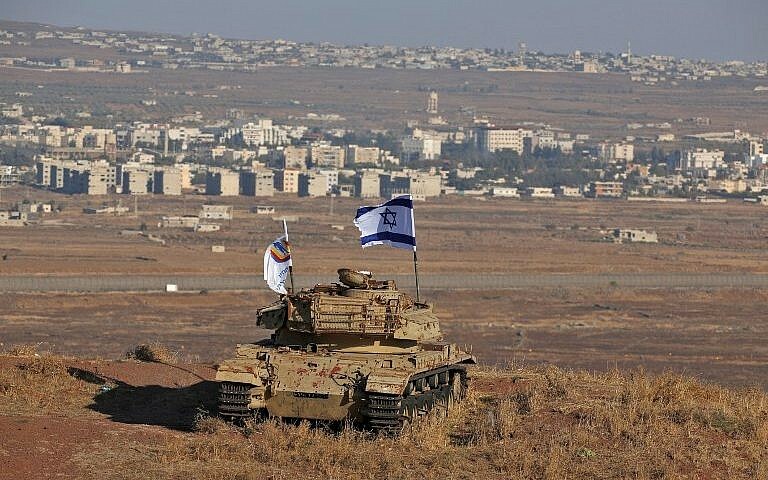 As a response to the growing Iranian military presence in Syria, Israel began establishing a small buffer zone in the Golan Heights in Syria. The Golan Heights is a small, contested mountainous region lying between Israel, Lebanon and Syria. The buffer zone has included a direct military presence, the support of local militias that function as Israeli-backed border police and community outreach. The establishment of the buffer zone received significant attention in 2015, when it was revealed that Israel was treating injured Sunni extremists from groups such as al-Nusra Front, which had former ties to al-Qaeda. Israel also sent charity and civil society organizations like Amaliah into Syria to conduct community outreach and aid. Part of Amaliah’s mission is to train local law enforcement in addition to constructing hospitals and schools. The strategy to support the Sunni community in the Golan Heights, even its most radical contingencies, comes from an understanding that an emerging Iranian threat on Israel’s borders is much more dangerous than Sunni extremism. According to Amos Yadlin, the former military intelligence chief, Iran and Hezbollah "are the major threat to Israel, much more than the radical Sunni Islamists, who are also an enemy." Israel even gives direct support to a small Golani militia called Fursan al-Joulan, the Knights of the Golan. “Israel stood by our side in a heroic way,” a spokesperson for the group told The Wall Street Journal, in describing the importance of Israel’s support for the group. The militia functions as a localized border patrol to prevent the buildup of Iranian or Hezbollah forces near Israel. But as the Syrian war drags on and Israel senses its threats are gaining power, it has expanded the scope of its buffer zones. Plans are reportedly being implemented to grow Israel’s buffer zone to 40 kilometers into Syria, well beyond the Golan Heights and into the Deraa Governorate. The expansion of the buffer zone also increases the scope of support to include agricultural, educational and health projects, according to an investigation report released by The Intercept. The report also claims that other groups, not just the Knights of Golan, are under the control of Israel thanks to the support it provides them. Israel’s aim to cement itself as an integral partner to Sunni communities in southern Syria reflects a larger aim to solidify its own presence in Syria for the long run. This entails incremental changes in policy, small amounts of aid distributed, contracted infrastructure projects and coordination with groups. In other words, this type of incursion into Syria is, by its nature, quiet and spread out over a long period of time. This is less compelling than a jet being shot down or an Iranian facility bombed, but they will prove to be much more important in understanding the balance of power between Israel and Iran in their Syrian proxy war.